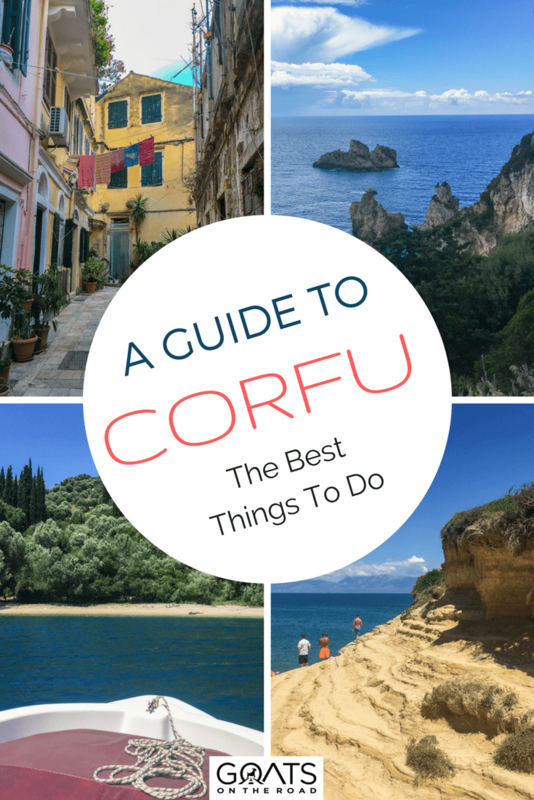 11 Things To Do in Corfu You Don’t Want to Miss! Goats on the Road Posts » Travel Blogs » 11 Things To Do in Corfu You Don’t Want to Miss! Lush interior, pristine coastline, unique rock formations and a romantic capital city. All this and more can be found on Corfu Island, a destination that truly delighted us during our trip to Greece. There are endless things to do in Corfu, you’ll never be bored. The northernmost (and most popular) of the Ionian Island chain, Corfu is actually very close to mainland Greece, and the country of Albania. Due to its proximity and history with mainland Europe, Corfu Island was actually one of the first Greek Islands to experience mass tourism. Because of this, Corfu has numerous accommodation options, many restaurants and bars, and a more cosmopolitan feel than neighbouring islands. We spent six days in Corfu (including our 10 year anniversary) and had many unique experiences along the way. Here’s my list of the 11 best things to do in Corfu. Did you know that on many of the islands in Greece, you can hire a boat yourself and rip around the coastline? Even if you don’t have a boat license?! If you’re looking for things to do in Corfu that are unique and fun, renting a boat is definitely it. We first heard about this when we were on a tour with Luxury Island Events on Zakynthos Island. This is one of the best things to do in Zakynthos, and while we didn’t have a chance to rent one there, we had to give it a try somewhere. For our 10 year anniversary, we did just that. We drove to the northeastern side of Corfu and met up with the rental company. After a very casual signing of documents and a once-over of the boat, we were set. The boat was 45 horsepower and could have fit six people, four comfortably. 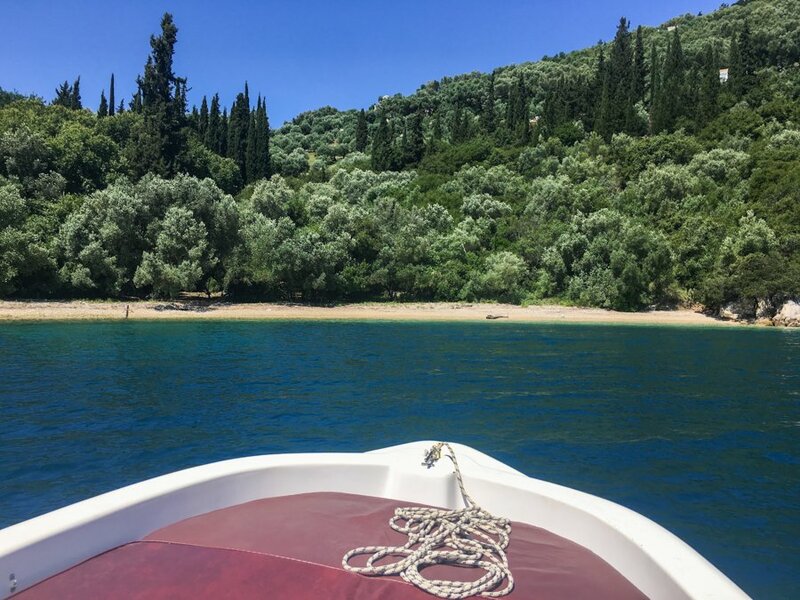 Whizzing along the beautiful coastline, stopping off at seaside taverns for food and drinks, and mooring up at secret coves to jump in the Ionian Sea, how fun is that?! Hiring a car is a must for getting around the island and seeing the interior, but hiring a boat is an excellent way to explore the coastline. This is definitely one of the best things to do in Corfu. 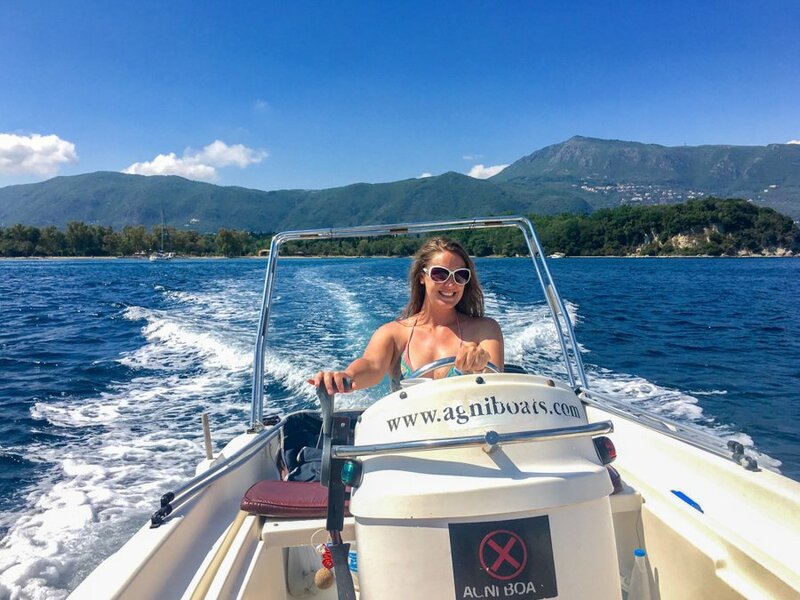 We booked with Agni Boats ([email protected]). Boat gas for a day of driving cost us €40. Make sure there are life jackets on board and you will need your own food and water. Highlights include the lighthouse, Rothschild Estate, chapel and underwater cave. Have lunch at Taverna Glyfa at Nisaki, the seafood is excellent. Pulling up to private bays is the best part about hiring your own boat! Don’t Forget Your Travel Insurance For Corfu! This UNESCO listed town is absolutely beautiful. Due to being under Venetian rule from the 14th century to the late 18th century, Venetian architecture can still be found on this island – especially in the capital of Corfu Town. 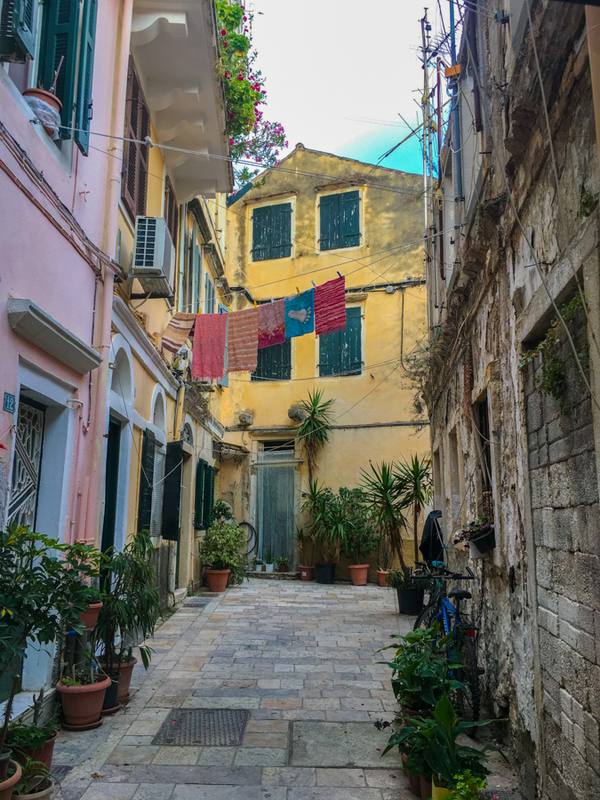 With Venetian style buildings, two fortresses, narrow little lanes and numerous restaurants, Corfu Town is a place you’ll want to spend some time exploring. We visited on two occasions, both times around sunset when the temperature was a bit cooler. You’ll wander beside pastel-coloured homes with wrought-iron balconies and wooden shutters. You’ll make your way through character-filled, cobbled streets – streets so narrow that laundry can be hung on a line strung between two adjacent houses. Slender alleyways give way to open plazas filled with tables from busy restaurants spilling out onto the street. Visit both during the day, and in the evening to see the town in two different lights. 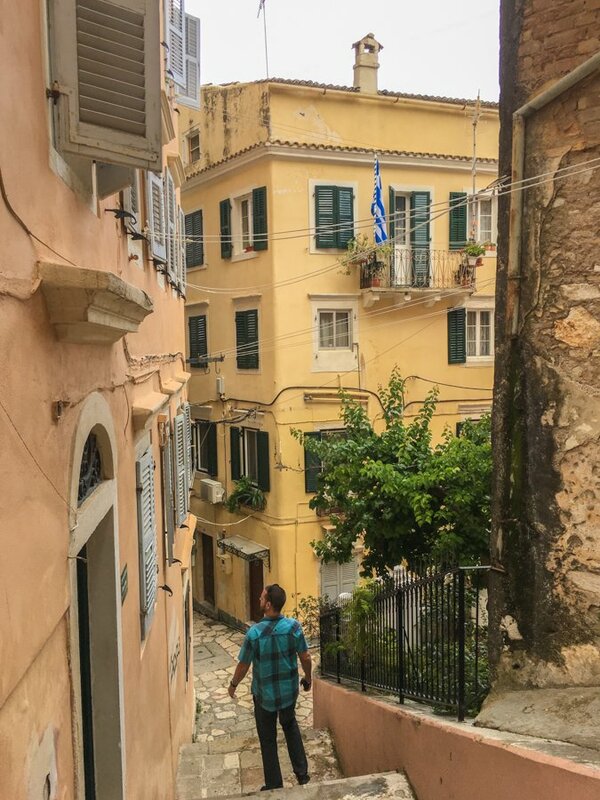 It’s one of the most romantic places we’ve been, and drinking wine in the old town was one of our favourite things to do in Corfu. Parking can be hard to find in Corfu Town. Park just outside of the town itself, and walk in. We highly recommend eating & drinking at Salto Wine Bar. Greek wines are on offer here (€20 / bottle, €5.50 / glass). Two appetizers & two mains costs us €38. Food, drinks and service are excellent. Wander around the lanes and get lost. Visit the sights, but spend time just meandering around. Entrance to the Old Fortress costs €6. Wear sturdy shoes and note that there’s not much shade. It’s a bit weird to have accommodation as a highlight of an island, but there some gorgeous options available on Corfu Island. We stayed in two beautiful properties and can recommend them both, for different reasons. 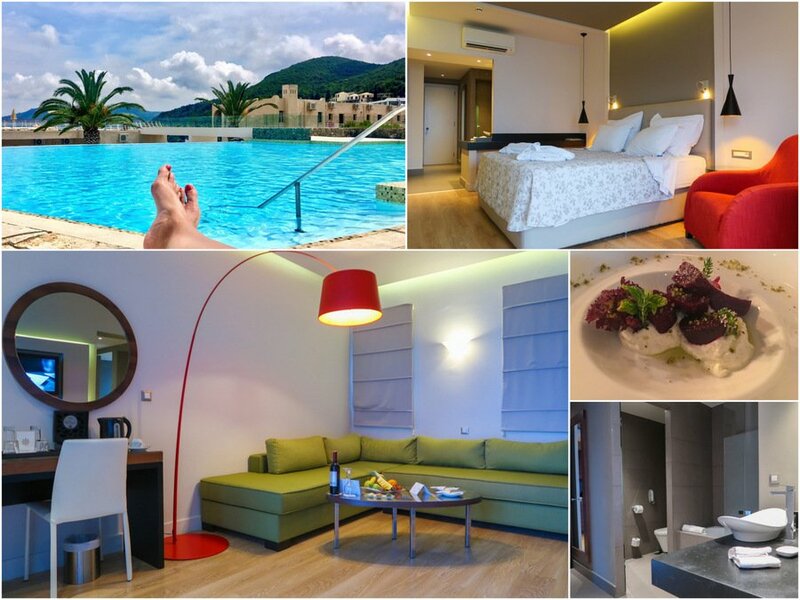 MarBella Corfu is a proper 5 star, luxury resort, complete with all-inclusive menu plans, four a la carte restaurants, four bars and a buffet style restaurant serving up fresh food for breakfast, lunch and dinner. 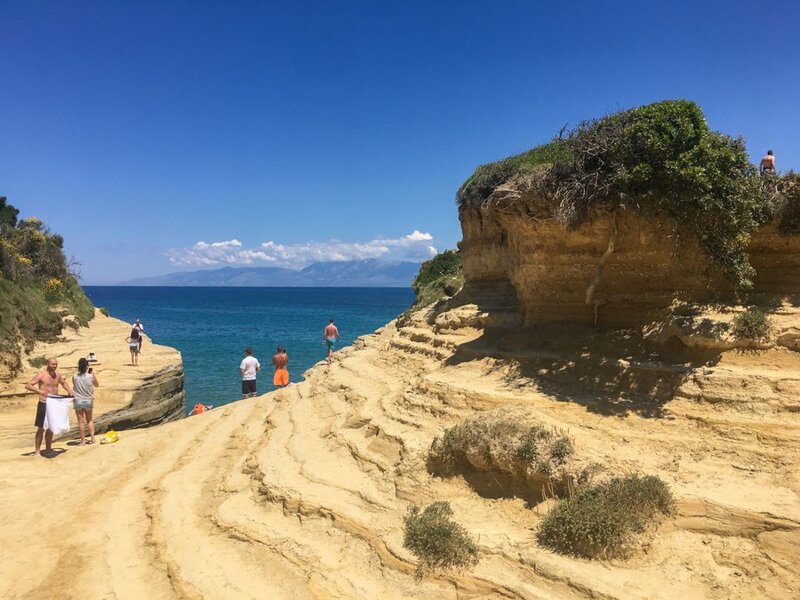 Set just steps from the Agios Ioannis Peristeron beach, near the south end of Corfu, this is an ideal location for exploring this half of the island. MarBella Cofru truly is a luxurious accommodation and if a resort holiday is what you’re after, then this is the place for you. We spent four nights here, but only dined at the restaurant two times – there were too many local restaurants that we wanted to check out! The welcome drink and complimentary wine & fruit is a nice touch, the building itself is modern, and the staff here are incredibly helpful and friendly. It was the perfect place to treat ourselves for our 10 year anniversary. On the northern end of the island, we stayed for two nights at Corfu Palma Boutique Hotel, and can highly recommend it. With just four floors, this low-rise hotel has an intimate feel. We were staying on the 4th floor in the Superior Design Suite, which was absolutely stunning. 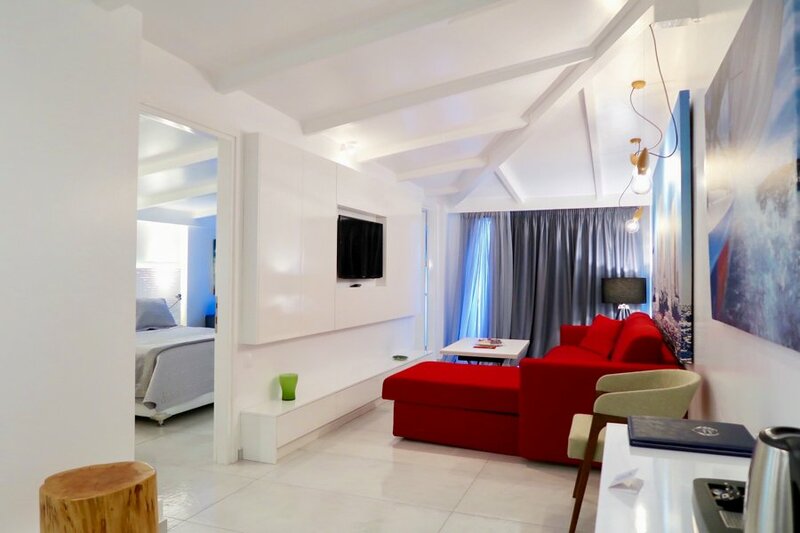 The rooms are spacious, bright and the modern decor is exquisite. The hotel offers a gym and a spa, as well as a large outdoor pool. The only downside is that it’s not located directly on the beach, but just a few steps away. The staff here are friendly and the manager, Spyros, will make you feel very welcomed! We thoroughly enjoyed our stay at this boutique hotel, and can recommend it based on the modern room itself, the lovely staff, the delicious food and the amenities on offer. 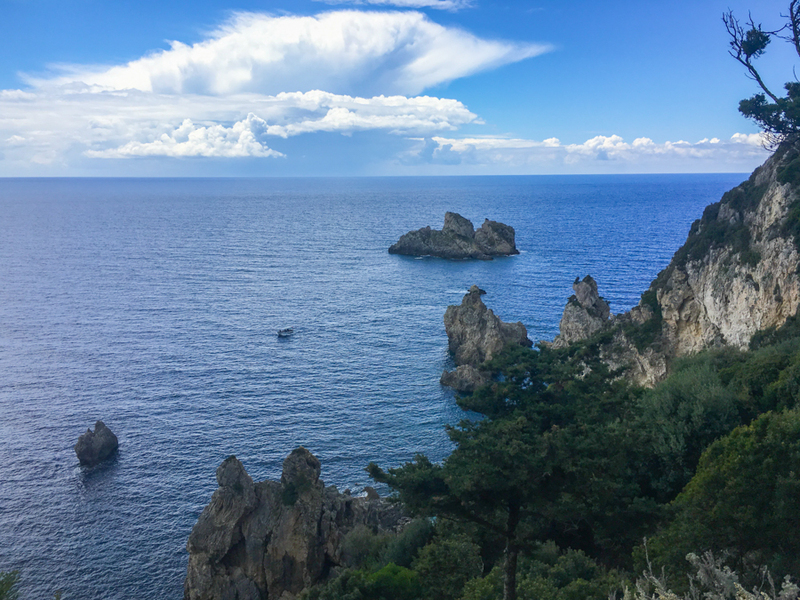 Since there are so many things to do in Corfu, and since the island is pretty big, I suggest splitting your time between the north and the south, if you can. That way, you can use your base in the north to explore nearby sites, then switch to your hotel in the south and check out that area of the island. Otherwise, you may find yourself driving a lot. The two hotels I listed above worked out well for us to do just that. If you’re interested in staying in a small apartment or guesthouse (rather than a hotel or resort) during your trip to Corfu Island, click here to compare prices and search through numerous options on Booking.com.  Note: We were offered complimentary rooms at these two hotels through our partnership with Discover Greece, but we were never asked to write positively about them. All thoughts and opinions are that of Goats On The Road and were not swayed by complimentary services offered. There are over 4 million olive trees on Corfu Island, 95% of which are lianolia variety. 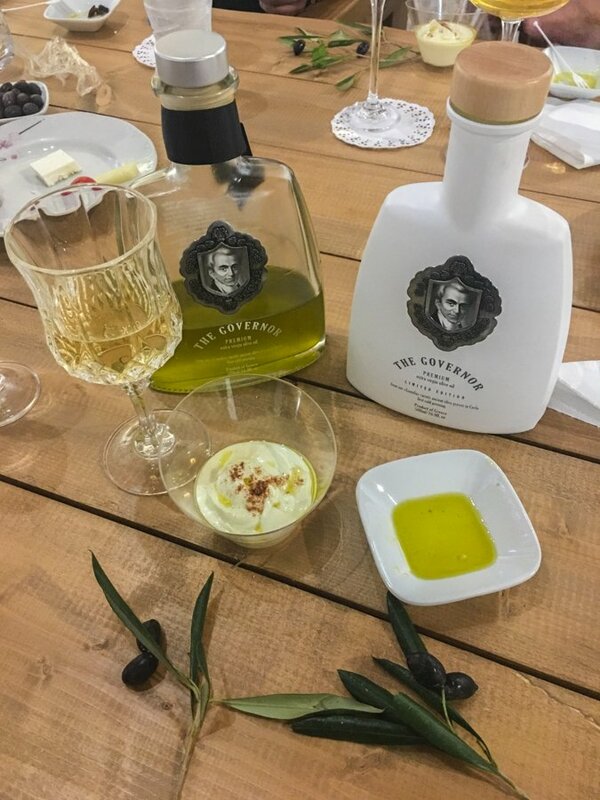 There are a few products that Greek people have been using throughout the ages, olive oil is one of them. It has always been a big part of their diet, traditions and history. Olive groves provide jobs and food for the people, and have for many years. Learning about the production of olive oil is one of the most important things to do in Corfu, and Greece as a whole. The Governor is a 5th generation, family run establishment on the island of Corfu. It’s one of the most awarded premium olive oils out there. Not only does the olive oil taste delicious, but it has incredible health benefits as well. This beautiful video was shown to us at the Governor’s Mill, and although it was filmed on the island of Crete, the traditions and values placed on the olive tree are the same in Corfu, and the rest of Greece. 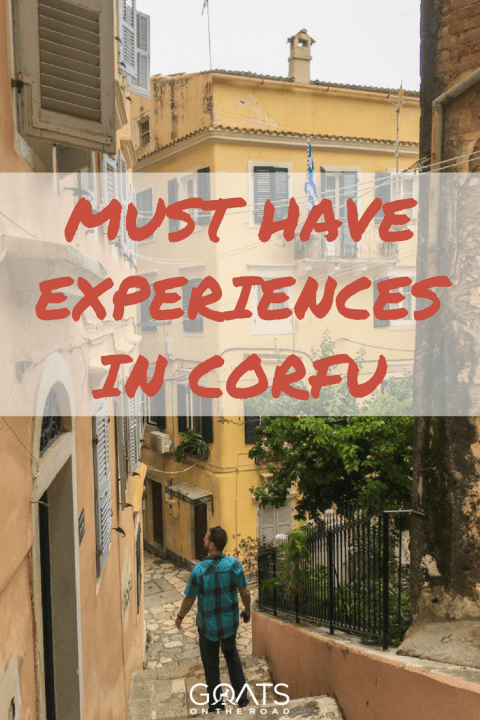 This is one of the best things to do in Corfu! The passion these two brothers have for their family company is inspiring. The flavour is exceptional and the health benefits are incredible! Tours cost €30 / person including olive grove and mill tour, and an olive oil tasting and seminar. To book a tour, check out their Facebook Page, their website, or call them at +30 6939334200. 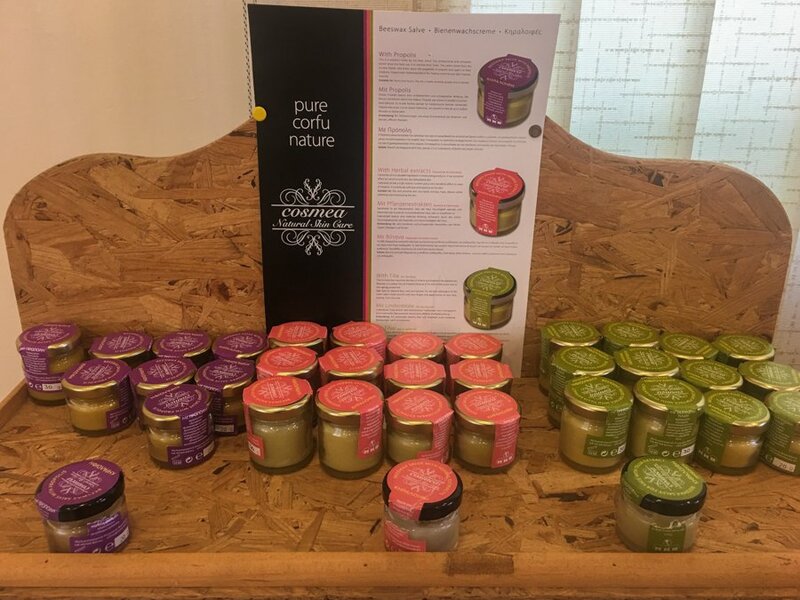 Another Greek product that has been used for centuries is honey, both for enjoyment as well as curing of ailments. Hipocrates said that this Nectar of the Gods “cleans sores and ulcers, softens hard ulcers of the lips, heals carbuncles and running sores”. Aristotle believed that honey prolonged life. We had heard about Mr. Honey (Panagiotis Vasilakis) from Spyros, the manager at Corfu Palma Hotel. Arriving at the office of Mr. Honey, we met a soft-spoken, chilled out man who told us his story of how he left a high-stress career in Athens for beekeeping in Corfu – a trade he knew nothing about before arriving here! Panagiotis is passionate about beekeeping and is keen to share his knowledge about bees and honey with you. Tours here are free, including samples of honey. The shop is called MKV – Melissokomiki Kerkyras Vasilakis, which is located here. There are over 800 churches and monasteries on Corfu Island! A couple of the standouts are The Vlacherna Monastery and Monastery of Paleokastritsa. When driving south from the airport, it would be hard to miss the Vlacherna Monastery, which sits out on the water, on an island of its own. The island is actually connected to the mainland by a stone bridge which crosses the bay. The chapel was built in 1685 and actually, this was once a nunnery monastery. These days, Vlacherna Monastery is a quiet place with cypress trees surrounding it, and dogs and cats roaming around. Fun fact, the For Your Eyes Only James Bond film had a scene set here. The second must-see monastery is Paleokastritsa. The location of this religious site is stunning. Set on a lush hill above the beach with the same name, and surrounded by sheer cliffs and pretty bays, a visit to this monastery (which is dedicated to the Virgin Mary) is a must. Paleokastritsa is still operating as a monastery today, and you may see a monk or two pass you by during your visit. It’s important to dress appropriately and respectfully when entering into the complex. This is a popular destination for group tours, but regardless of crowds, it’s worth a visit. Click here to open GoogleMaps location of Paleokastritsa. Click here for Vlacherna Monastery. While you’re in the area visiting the monastery, make sure to check out the beaches and town of Paleokastritsa. There are 6 stunning bays here, which are surrounded by olive and cypress trees. This is the perfect spot for spending the afternoon swimming, or just lazing on the beach. You’ll find numerous tavernas and restaurants here as well, including nearby Akron Beach Bar, which has a great setting for a meal, or drink. You’re in Greece, so it’s no surprise that relaxing on a beautiful beach is one of the top things to do in Corfu. In fact, the main beach of Paleokastritsa itself is known for being one of the best beaches in Greece. 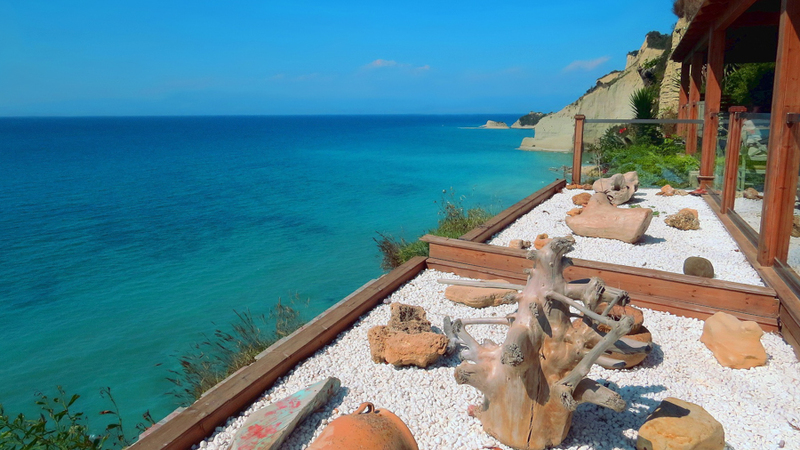 Located on the very northwestern tip of Corfu Island, you’ll find 7th Heaven restaurant. With expansive views from atop a cliff out to the Ionian Sea, this is the ultimate spot to watch the sun go down. It’s mostly known for being a place to grab a drink with sunset, but they also have food available. Cocktails go from around €7 and if you don’t have your own wheels, a taxi from Sidari to here is around €9. The drinks may not be the cheapest, but you’re paying for the setting. Click here to see a GoogleMaps location of the restaurant. Speaking of Sidari, while you’re on the northern end of the island, make sure to visit the Canal d’Amour, or Love Canal. The rock formations around this area are colourful, crumbly and very unique. You’ll find people laying on the beach, or jumping off of the cliffs into the clear water. There’s a canal here, which leads under the cliff. It’s said that if you swim through, you’ll get married soon. Whether or not that’s true, it’s still one of the most popular things to do in Corfu. You won’t be fully submerged in water, and will be able to breathe the whole time, so don’t worry! Plus, the canal isn’t very long. Swimming around the cliffs at Sidari is a must! On a windy day, the waves can be a bit rough here if you’re planning to take a boat around the coast, but being at the beach is fine. You’ll find numerous hotels, restaurants and tavernas in the town of Sidari, making this the perfect spot to spend the afternoon, or longer. Try to peel yourself away from the beautiful beaches and the romantic towns to get some exercise. Renting a mountain bike to explore either independently, or on a tour is an excellent way to see the off track interior of the island. Regardless of whether you’re a beginner or more advanced, there’s a route for you. Check out the guys at The Corfu Mountain Bike Shop to rent a GIANT bike, or book a tour. If you’re looking for a fine dining experience, make sure to visit Etrusco Restaurant in the town of Dassia. Michelin Starred chef, Ettore Botrini is an Italian Corfiat, with three restaurants in Greece – Corfu, Rhodes and Athens. This highly acclaimed chef knows presentation! Each and every dish comes out perfectly manicured, with a story behind each plate. The outdoor dining area is surrounded by trees and pretty pink bougainvillea flowers. Plus, the kitchen is behind a large window, so you can watch all of the action unfold while you wait for your food. You can order a la carte, or choose from one of three set menus: First Face, My Origins, or Zenith. 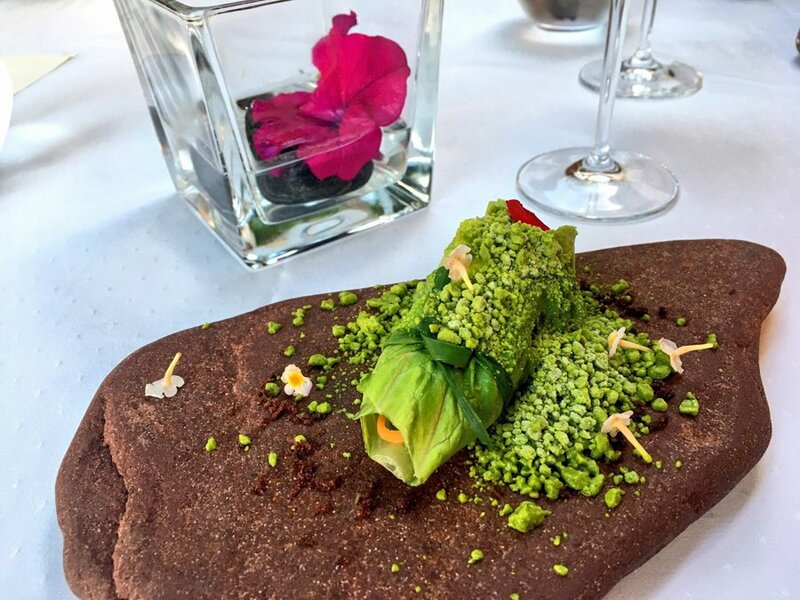 All three have the option of including a wine pairing and go for around €70 – €160 for 7 – 12 courses, so it’s definitely a “special occasion” kind of place for most (including us). Click here to find Etrusco Restaurant on GoogleMaps, and click here to make a reservation and see the menus on offer. 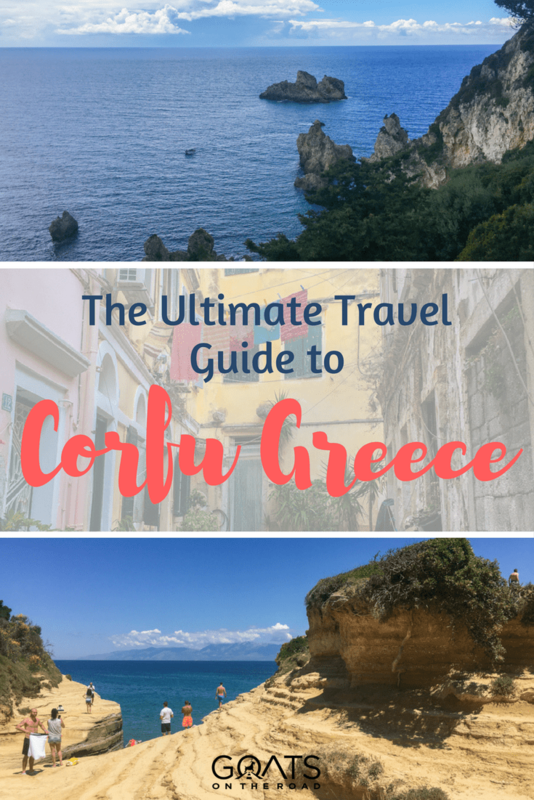 Ready to Travel to Corfu Island? Since Corfu is so close to mainland Europe, getting here is easy as well. You can take a quick flight from anywhere in Europe, with a short layover in Athens, or if you’re flying from North America, you’ll need to stop over in Europe before continuing on to Corfu. Check out Aegean Airlines for flights, or search engines such as Kayak.com and Google Flights. If you’re nearby, you could also take a boat to Corfu Island! Hop over by boat from Albania or Italy. With so many islands available to visit in Greece, it can be hard to decide which one to choose. If you’re interested in beautiful beaches, excellent restaurants, religious sites, culture & history and stunning accommodations, then Corfu Island is for you. Check out our Travel Videos from Corfu! Thank you to Discover Greece for assisting us with our trip to Greece. As always, all thoughts and opinions remain our own. Have you travelled to Corfu? What were some of your favourite things to do in Corfu? Did we miss any of the highlights in the article? Share with us in the comments! Excellent Article with photos and video. I love to read your article but you will add some places which is popular in Corfu like Archaeological Museum of Corfu, Church of Agios Spyridon, Museum of Asian Art etc. This is clearly like an Heaven, everything is awesome, want’s to go there as soon as possible.